I'm hoping this post finds you well and enjoying this holiday packed season. Amidst the extra activities I hope you find quiet times to reflect on the year as it draws to a close. This time honors all you have done and suggests ideas of where you might focus your energy next year. It's good to also look at the wider world around you and recall what you've contributed to the people, organizations and ways of being that you believe in. 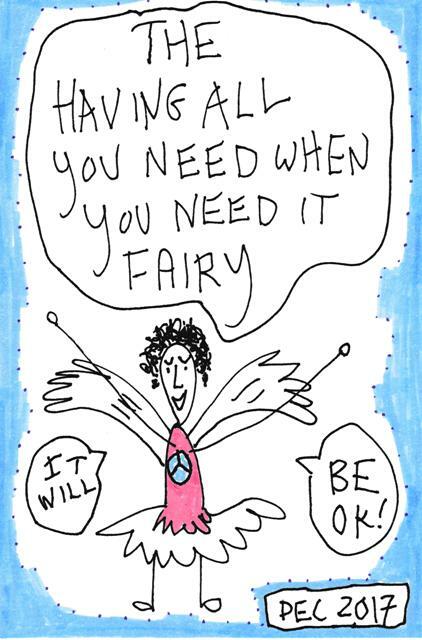 I'd like to share the fairy I randomly selected for this post. Once again I turned to my prototype of the 'Fairy of the Day' app. Whenever I see her I relax into her idea of 'Trusting the Way' and join her 'Let's Go!' attitude. She seems perfect for this time of saying goodbye to 2017 and stepping into the unknown future. One of the notable shifts in Bluebird Fairies this year is that I've started adding color to the fairies. On the app some of the fairies have color and others, like the one above, do not. Now as I make more, the color seems to be coming more readily. I look forward to connecting with you in the freshness of 2018.